Rickie Fowler: An Ace....for Charity! "These guys really are good"! 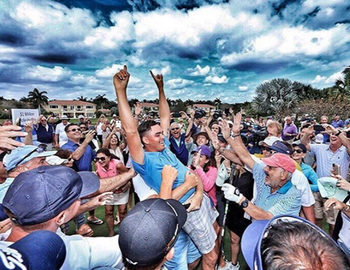 Ernie El's held his annual Els for Autism golf outing on March 7th and Rickie Fowler came to play. Rickie stepped up to the 113yrd. par 3, where a $1 Million donation prize was on the line, and in one of the coolest sports moments of the year drained the shot. Everybody at Old Palm Golf Club in Florida went crazy! Congrats to Rickie for not only Acing the hole, but Acing the event as well and a big congrats to Ernie Els for hosting an amazing event.